Learning golf basics is part of a youth golf program. Golf programs for kids are essential for youth development in the sport, dedication to exercise and a promotion of golf in inner-city and rural areas. These youth programs offer instruction, golf etiquette basics and an opportunity to compete with other youths regionally and in state competitions. The George State Golf Association junior golf program was started in 1989 and provides an opportunity for youth to enjoy the game of golf regardless of their talent level. Activities include non-competitive games. The program provides educational and instructional support for girls ages 17 and under. The Greenwood Hills Junior Program in Wisconsin helps youth golfers understand the basic rules of golf and develop the sport's fundamentals for an age-appropriate level. The classes run in two-day increments during the summer for one month. Juniors learn the basics on the course's putting greens and short-game areas. Youth golfers also will be instructed on driving and long-iron fundamentals on Greenwood Hills practice range. Golf etiquette also will be discussed. The final day of class will include a skills challenge, cookout and awards program. The program is available for kids ages 8 and older. The Windy Hill Junior Golf Program in Virginia features golf professionals that provide strategies to get children interested in golf while making the sport enjoyable. The program provides children with clubs to use for training classes. For children ages 7 to 17, instructors offer 1-hour clinics on the basics of setup and swing. 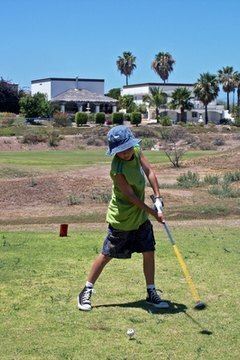 The PGA Clubs for Kids are held every March to June with individual training provided. A rookie program provides youth instruction about stance, posture and education on fundamentals. Advanced classes and summer camps also are available.